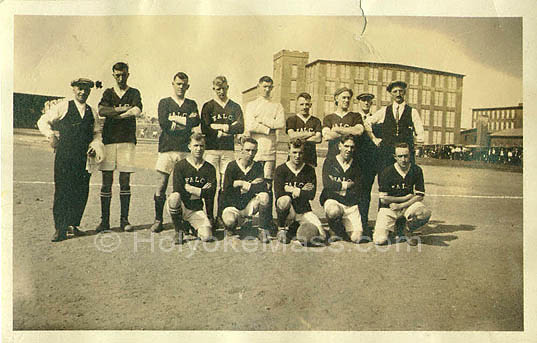 I became interested in the Holyoke Falcos because I was curious how they became one of the founding teams of the American Soccer League (ASL) in 1921 and why they dropped out after only one season. The ASL was one of the first major professional soccer leagues in the United States although it was made up of teams from only the Northeastern part of the country. I knew beforehand that it might be difficult to tell the story but I had no idea how interesting and ultimately how rewarding the quest would become. In many ways the search for the Falcos illustrates some of the challenges involved in researching the history of American soccer. First it shows a general lack of published information, although this is changing rapidly as new books and articles appear. Second it shows how difficult it can be to find traditional sorts of archival records including financial information, contracts and other documentation. Finally, it demonstrates that historians are often reliant on newspaper accounts and that these articles can be maddeningly incomplete and/or just plain wrong. I started the search for the Falcos with Colin Jose’s book on the ASL titled American Soccer League, 1921-1931: The Golden Years of American Soccer. Early on Jose informs the reader that the institutional records of the league have never been found, a fact that makes the research that follows all the more remarkable. The book is less a comprehensive history and more a detailed numerical record of the ASL, with lists of results, records and brief narrative summaries of each season along with selected player biographies. Through meticulous and undoubtedly tedious research Jose has recovered much of the statistical history of the league. Despite this notable achievement, the information on particular teams or players can be inconsistent or missing, especially for lesser known clubs like the Falcos. Most players are listed by last name, as was the newspaper convention at the time, sometimes with a first initial but most often not. In the section on the Falcos for instance, we find that “J. Downie” was the club’s leading goal scorer during the season, and that “Moodie” played in eighteen games. The entry contains no other information about the club beyond the lists of games and names. In one of the narrative sections there is a brief reference to the textile firm that sponsored the club, Farr Alpaca. The company had long been out of business by the time I began my research but for many decades it had been an important part of Holyoke’s industrial landscape. I hoped that perhaps a corporate archive might exist and that it would contain information on the soccer club. From Frances Cornwall Hutner’s 1951 book The Farr Alpaca Company. A Case Study in Business History I learned that when she conducted her research the company’s archive was housed at Smith College in Northampton, Massachusetts. Hutner later characterized the records as being in a great state of disarray when she worked with them. The records came to Smith sometime after the firm ceased to exist in 1940. Presumably, the extensive collection, running to at least 280 linear feet, arrived at the college because of historian Constance Green. An alumna of Smith and later a professor there, she was also married to a Farr Alpaca executive. Green used the records for her groundbreaking book Holyoke Massachusetts. A Case Study of the Industrial Revolution in America. In the late 1980s, Smith College donated the archive to the Springfield City Library. The library culled some records and sold more to at least two different document dealers. The American Textile History Museum (ATHM) in Lowell, Massachusetts purchased most of the archive in 1987 while the records involving Springfield were moved from the City Library to the Connecticut Valley Historical Museum. Eventually the materials that had remained in Springfield were donated to ATHM in 1996. The archives as they currently exist are incomplete in several ways. Although the company was in business from 1873-1940, the bulk of the records held by ATHM span the period 1874-1918. You’ll note that the best documented years end before the Falcos joined the ASL in 1921. It is possible that some of the missing records were destroyed in a fire as several items in the collection are described as having fire damage. Despite the existence of a large amount of material the crucial items for my research, information related to the company’s soccer team are missing or never existed in the first place. Despite the fact that the company supported a large number of athletic teams, including cricket, bowling and baseball along with soccer, none of the existing company records lists a single item directly related to these activities. As a result I turned to newspapers. The main local papers during the period were the Holyoke Daily Transcript and the Springfield Republican. The Transcript has not been digitized and so I spent hours searching microfilm for stories about the Falcos and the clubs that came before them. At times it was like looking for a needle in a haystack. It also turns out that the Falcos hometown paper provided less coverage of the local side than did the nearby Springfield Republican. The archives of the Republican have been digitized and this made searching much easier and far more efficient. The newspapers provided me with names, dates and other important information that allowed me to tell a more complete version of the Falcos story. I supplemented these sources with materials, including City Guides and maps, from the Holyoke Public Library History Room and Archives. It was at the Archives one day that another researcher happened to mention that a vintage soccer photo hung on the walls of a local hardware store and bike shop. Sure enough, the owner of the shop enjoyed collecting historical photographs of the city and had an image of the 1910 Chaloux cup match between Farr Alpaca Football Club and Clan MacLaren. The search for the Falcos took diligence, travel and a bit of luck but eventually I turned my findings into an article called “The Rise and Fall of Professional Soccer in Holyoke Massachusetts, USA” that was eventually published in the British journal Sport History in 2011. A version of this essay originally appeared on the website www.SoccerHistoryUSA.org in 2013. Brian D. Bunk teaches history at the University of Massachusetts Amherst and is host of the Soccer History USA podcast. Follow him on Twitter at @SoccerHistoryUS . Great post by Dr. Bunk. He certainly highlights some of the obstacles we all face in doing American soccer history–an uncooperative historical record, uncertain newspaper reportage, marginalization of the sport, etc. Thanks for sharing!